A laboratory culture of Psilocybe mexicana, grown from spores, an innovation that speeded analysis of the ephemeral mushroom. CHEMICAL INVESTIGATION of the Mexican mushrooms was difficult until they could be cultivated. They are almost wholly water and great quantities of them are needed for chemical analyses because their chemical constitution is so ephemeral. The clarification of the chemistry of the Mexican mushrooms was possible only because mycologists were able to cultivate the plants in numbers sufficient to satisfy the needs of the chemists. This accomplishment represents a phase in the study of hallucinogenic plants that must be imitated in the investigation of the chemistry of other narcotics. The laboratory, in this case, became an efficient substitute for nature. By providing suitable conditions, scientists have learned to grow many species in artificial culture. Cultivation of edible mushrooms is an important commercial enterprise and was practiced in France early in the seventeenth century. Cultivation for laboratory studies is a more recent development. 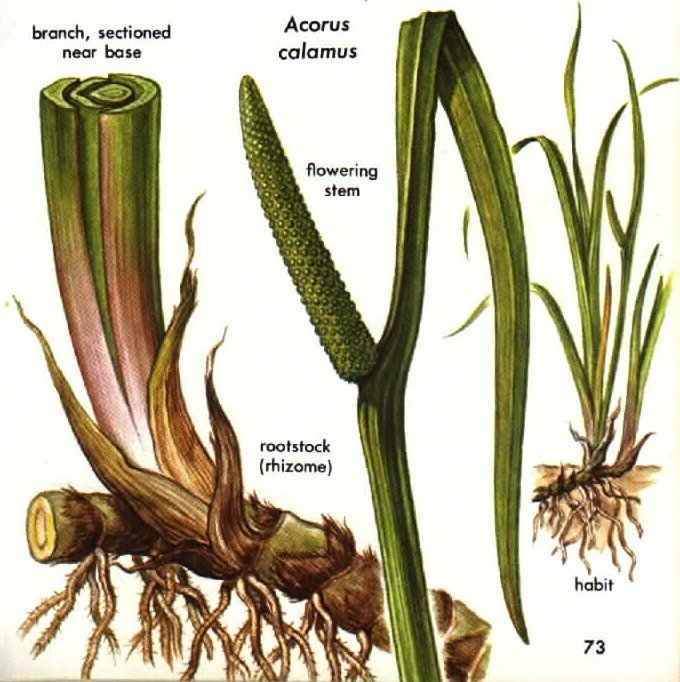 SWEET FLAG (Acorus calamus), also called sweet calomel, grows in damp places in the north and south temperate regions. A member of the arum family, Araceae, it is one of two species of Acorus. There is some indirect evidence that Indians of northern Canada, who employ the plant as a medicine and a stimulant, may chew the rootstock as an hallucinogen. In excessive doses, it is known to induce strong visual hallucinations. The intoxicating properties may be due to a-asorone and ß-asarone, but the chemistry and pharmacology of the plant are still poorly understood. 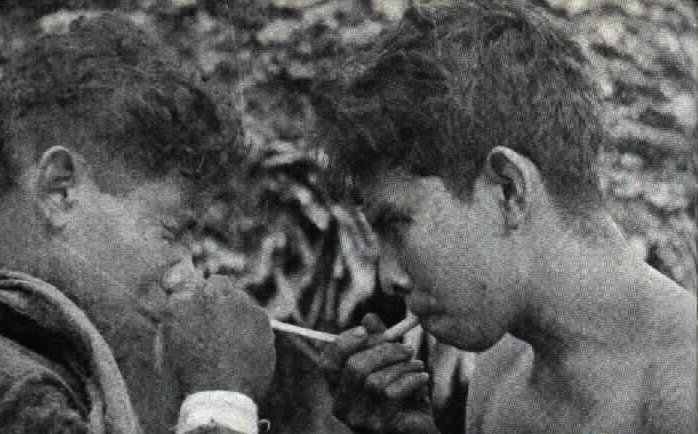 Colombian Indians using a snuffing tube fashioned from a bird bone. 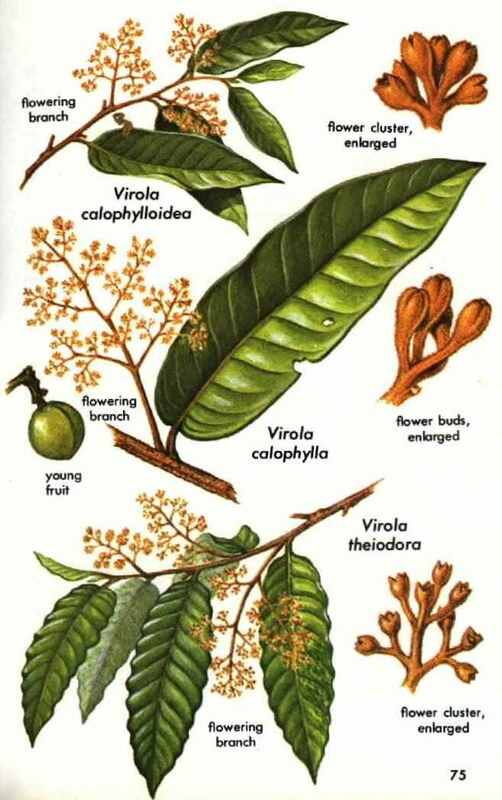 VIROLAS (Virola calophylla, V. colophylloidea, and V. theiodora) are among the most recently discovered hallucinogenic plants. 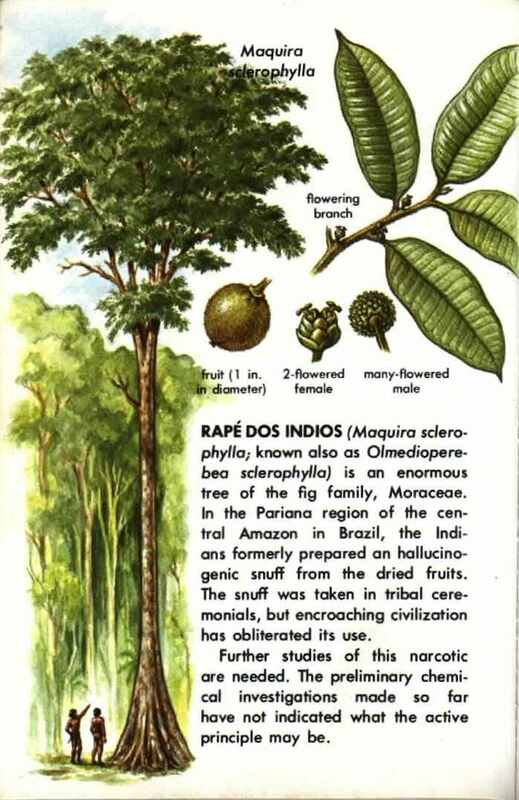 These jungle trees of medium size have glossy, dark green leaves with clusters of tiny yellow flowers that emit a pungent aroma. The intoxicating principles are in the blood-red resin yielded by the tree bark, which makes a powerful snuff. Strip of bark from Virola tree, showing oozing resin. 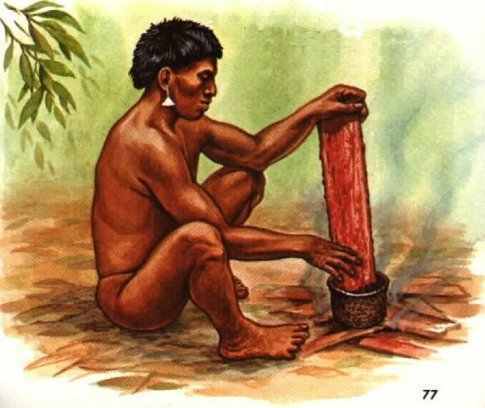 Waiká Indian scraping Virola resin into pot, preparatory to cooking it. PREPARATION OF VIROLA SNUFF varies among different Indians. Some scrape the soft inner layer of the bark and dry the shavings gently over a fire. The shavings are stored for later use. 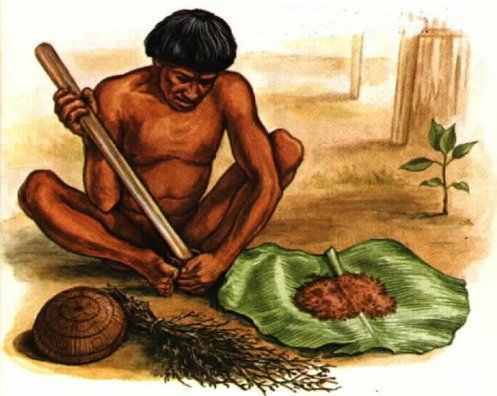 When the snuff is needed, the shavings are pulverized by pounding with a pestle in a mortar made from the fruit case of the Brazil- nut tree. The resulting powder is sifted to a fine, pungent brown dust. To this may be added the powdered leaves of a small, sweet-scented weed, Justicia, and the ashes of amasita, the bark of a beautiful tree, Elizabetha princeps. The snuff is then ready for use. for additive to Virola snuff. A SNUFF-TAKING CEREMONY is conducted annually by many Waiká tribes to memorialize those who have died the previous year. 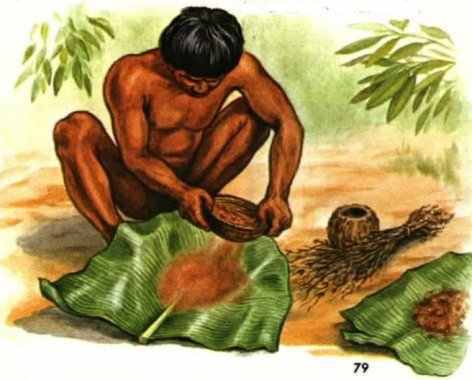 Endocannibalism comprises part of the rite; the ashes of calcined bones of the departed are mixed into a fermented banana drink and are swallowed with the beverage. The ceremony takes place in a large round house. Following initial chanting by a master of ceremony, the men and older boys form groups and blow huge amounts of snuff through long tubes into each other's nostrils (p. 74). They then begin to dance and to run wildly, shouting, brandishing weapons, and making gestures of bravado. Pairs or groups engage in a strange ritual in which one participant thrusts out his chest and is pounded forcefully with fists, clubs, or rocks by a companion, who then offers his own chest for reciprocation. Although this punishment, in retribution for real or imagined grievances, often draws blood, the effects of the narcotic are so strong that the men do not flinch or show signs of pain. The opponents then squat, throw their arms about each other, and shout into one another's ears. All begin hopping and crawling across the floor in imitation of animals. Eventually all succumb to the drug, losing consciousness for up to half an hour. Hallucinations are said to be experienced during this time. 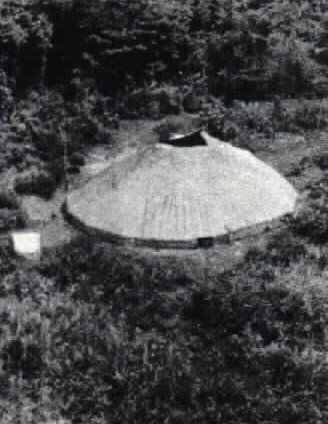 Waika round house in clearing in Amazon forest.